Publius Servilius Casca Longus was was one of the assassins of Gaius Julius Caesar. Afterwards, Casca fought with the liberators during the Liberators' civil war. He is believed to have died by suicide after their defeat at the Battle of Philippi in 42 BC. He struck coins as Legatus jointly with Brutus between 43 and 42 BC. Gens Servilia was a patrician family at Rome. The gens was celebrated during the early ages of the Republic, and the names of few gentes appear more frequently at this period in the consular Fasti. It continued to produce men of influence in the state down to the latest times of the Republic, and even in the imperial period. The first member of the gens who obtained the consulship was Publius Servilius Priscus Structus in 495 BC, and the last of the name who appears in the consular Fasti is Quintus Servilius Silanus, in AD 189, thus occupying a prominent position in the Roman state for nearly seven hundred years. The Servilii were divided into numerous families; of these the names in the Republican period are Ahala, Axilla, Caepio, Casca, Geminus, Glaucia, Globulus, Priscus (with the agnomen Fidenas), Rullus, Structus, Tucca, and Vatia (with the agnomen Isauricus). The Structi, Prisci, Ahalae, and Caepiones were patricians; the Cascae plebeians. Other cognomina appear under the Empire. 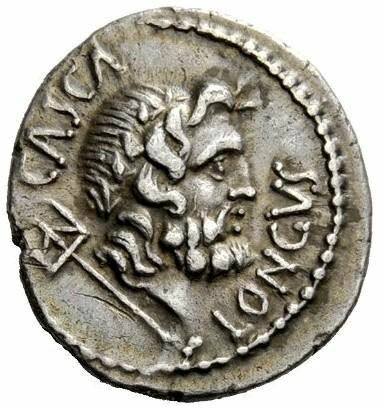 The only surnames found on coins are those of Ahala, Caepio, Casca, and Rullus.